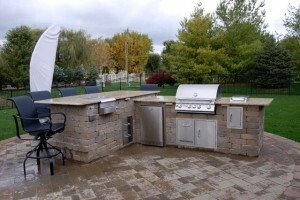 Indianapolis Outdoor Kitchens are becoming more and more popular in the Indianapolis and surrounding areas. A well-designed kitchen can be a dream to many homeowners who enjoy entertaining and spending time outdoors. 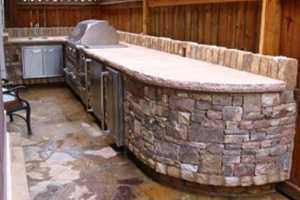 Whether you choose to add a basic island for your grill or you are interested in a gourmet kitchen created with brick or stone, we have been designing outdoor kitchens for 25 plus years. The best part is we handle everything from start to finish, from the initial consultation, planning, design, build and installation. We are your one stop landscaping company that will be with you every step of the way. Not only are outdoor kitchens a desirable addition to your Indianapolis outdoor living space, but they can add value to your home, while providing enjoyment for the whole family. Imagine all of the quiet evenings you can grill outside during the Spring, Summer and Fall. 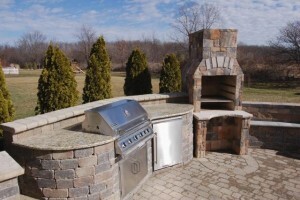 Building an outdoor kitchen starts with a vision from our clients and the expertise of our landscaping and design team. We will meet with you to discuss the functionalities you would like your outdoor kitchen to have, the utilities and appliances, space of the area that your kitchen will require, what materials are best suited for your design and the vision you are looking for. Our design team will take into consideration all of the ideas that we have comprised and make your vision come to life. Outdoor Kitchens are additions to your interior kitchen. Depending on what you will be using your kitchen for, there are a variety of options that you can add to your kitchen. 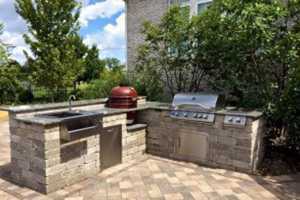 Every Indianapolis outdoor kitchen we design is custom made, therefore the functionality is entirely up to the client and what they are looking for. Outdoor Kitchens should be an extension of your home, therefore the design and landscape of the kitchen should match or correlate that of your Indianapolis home. The materials and appliance styles from your indoor kitchen may replicate your outdoor kitchen. This way the design aspect is continued from within the home to the outside. We will use the most durable materials that will withstand any type of Indianapolis weather. We understand each kitchen we build will provide a different function for each client, therefore we take the time to build your outdoor kitchen with care. We know that doing any home addition or renovation can be a daunting process, that is why you are in good hands with our team. We do the best we can to not disrupt your routine and stay out of your while during installation. We can’t wait to begin your brand new outdoor kitchen addition. It’s now time to begin creating the outdoor kitchen of you dreams. With your vision and our experience, we will create a functional outdoor kitchen, that will stay in your budget and also add value to your home. At Country Gardens, we have a team of creative minds who think outside the box, there is no project to large or small for us to create. Please feel free to browse through our gallery to view some of our projects throughout the Indianapolis area. If you have any questions or to get started on your outdoor kitchen, please contact us at 317.339.7847 or email us at [email protected].